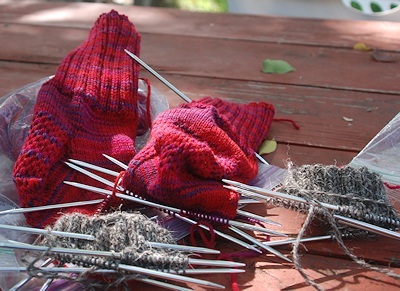 The "lead" pair, Mountain Colors' "Indian Paintbrush" socks are both past the gussets and onto the foot, while the Herdwick socks are on the cuff ribbing, gaining 1-2 rows a day. This is the lighting angle that shows the colors of the Mountain Colors yarn the truest: at least two shades of red, rose, magenta, burgundy, and purple. Stitch definition is lovely with the Mountain Colors yarn, really showing off the Eye of Partridge heel reinforcement (which extends for another inch under the heel.) The Herdwick yarn is a very different yarn, undyed and mixed of both light and dark wools. It's not a soft yarn, although it feels wonderful once it's on. You can see the ribbing developing, but it will never be as "sharp" as in the other yarns. It's very warm. I plan to wear the Herdwick socks when it's below freezing. The Mountain Colors socks will go into the regular rotation for ordinary socks. The sporty-shorty socks are summer socks and will drop from the rotation until hot weather next year. Next up after the Mountain Colors socks are done will be a turquoise pair; next up after the Herdwick socks will probably be another pair of Herdwick socks. There won't be another picture of either of these until they're done, unless something "interesting" happens. I'm Karen -- and I'm sorry that livejournal won't let me be clearer than that without invoking powers of darkness (ie., I don't trust them with my true ID even though it's something I'd happily give up to companies that didn't make a living off of knowing such things...). The "long and short of it" is that once something you're knitting gets small enough, round needles don't come in short enough (and believe me -- I've got some of the shortest round needles made and trying to use them drives me mad!!!) lengths to be useful. Socks are just one such example. But those are glorious socks. I don't usually like vibrant reds mixed with purples (I had a dress once that mixed them and I always had the sense when I took it off that I was shaking off a nightmare), but this combination WORKS. Colors are so personal...I've always loved vibrant, intense, saturated colors (and grew up in a time when girls were supposed to like pastels--which I still don't, much.) That's one of the unexpected good things about making my own socks--AT LAST I can wear socks that I really like for the colors as well as the feel. I didn't realize, partly because my mother made me only two pair--a blue I really liked and then--when I asked for red, a light sort of pea soup green that I didn't like at all. 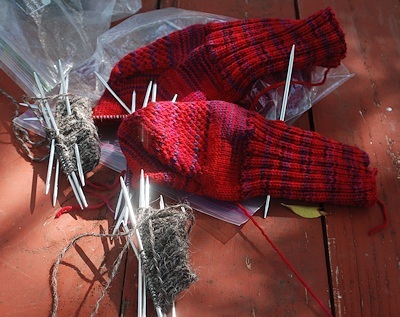 Anyway--knitting, even more than sewing, lets the individual make things in the colors the knitter likes best. Colors that make the knitter happy just looking at the yarn, holding it, knitting with it. Mountain Colors does such pretty yarn. They certainly do. I have three colorways of it, all lovely. Would love to get more but it's a lot pricier than the other yarn I make into socks. Saw a pair of hand-knit wool socks on Pinterest where the heel-turn was knit in a spiral--contrasting colors--and immediately thought of you. Was it a short-row heel? I've read that those produce spiral patterns with hand-painted yarn. Or something else? The heel-flap heels work best for me because of the shape of my feet.